Clearly Siberian Cats are extremely popular and we get lots of requests about our kittens so we have worked out an easier, more effective way in arranging for serious owners to make sure they do not miss out on getting one of our lovely Siltorscha Siberians. How can you secure your own Siberian kitten? Simple. Submit to us a 25% deposit of the total cat fee and as soon as the right kitten for you arrives we will deduct this amount off the total cost and fix up the final amount when you come to pick up your new family member! Our Siberian kitten are just like family members to us and we raise them with extreme amounts of attention and loving care. The first 12 weeks after birth are shared doing exactly what we do as we incorporate them into our daily lives to ensure each kitten is well adjusted to daily living and life. Our sole purpose in breeding is so that we can share our pride and joy with you and your loved ones. Occasionally we do like to keep a few of the kittens for ourselves or other breeders in the area who want to continue on a specific gene pool. After the 12 week period all remaining kittens will be offered for sale FIRSTLY to those who have placed the 25% DEPOSIT in the order we receive them. So with all of this to take in, we at this stage only require owners who are looking at keeping their Siberian kitten inside all the time. If this is something that you think will be difficult for you to follow, and then please find another breeder/breed more suitable to your needs. After you have chosen your newest family member, you may not be able to frequently visit us in order to see your kitten grow up. However if this is the case, we are extremely happy to keep you up to date with as many photos and videos as you would like to see the progress it is having. This would be perfect too if you would like to keep a picture record of your cats life right from an early age! Before you take your kitten home we will inform you on it’s diet, litter usage as well as other products that will be beneficial to your cats life so that you will have ample time to get everything ready for your kittens arrival. Another thing we will arrange is the best time to collect your kitten after the initial 12 week period from its birth. You still need to get a yearly booster needle to keep your kitten fully protected! Before your kitten leaves all worming will be maintained and 100% up to date. The brand we like to use is Ambex 2 and if you would like us to maintain flea control then we recommend Advantage for Cats. Also on departure your Siltorscha Kitten will be freshly bathed and combed for you to love immediately and completely free of any bugs or parasites. We can ask us also to provide a link from where you can get a pack containing all relevant kitten care products as well as a few select toys and a special blanket too. To make your mind rest, we are 100% registered with the Queensland Feline Association and always abide by each of their regulations. We provide a pedigree with each of our kittens and they too are registered with QFA Inc. It would be great if you could choose a name for your new family member before we print up the pedigree certificate so we can include it with your new kitten. If you have cat allergies or anybody in your household does, feel free to contact me directly and I am happy to discuss potential methods of prevention prior to paying a deposit on your kitten. It is important to take this down as we will under no circumstances allow a house with allergy problems to adopt one of our kittens. Not only I provide assistance in regards to allergy testing, but I am also happy to direct you to other breeders who have other experiences. There will be no charge for such a service if it is required. As mentioned, we love to hear the progress of our kittens! So please feel free to give us a call to let us know, or even better send us photos and videos as they grow up! Nothing makes us prouder to see a happy and healthy kitten grow and prosper into something amazing! 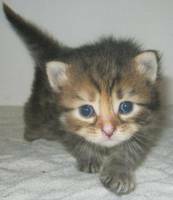 Cost: Please visit our page about the Siberian cat prices! If you have any further question in regards to our kittens or anything mentioned in this article, please email us or call me directly!